LeadingAge national is seeking feedback from members on a new proposed immigration and benefits rulemaking effort. 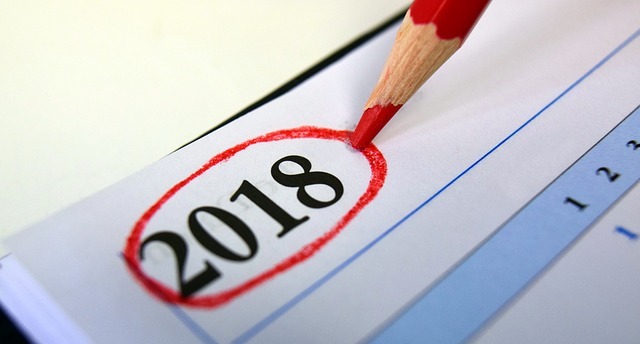 Comments are due to the Department of Homeland Security by December 10, so we hope to have member feedback by mid/late November at the latest. If you have questions or need additional information, please contact any of three LeadingAge natonal staff, including Eram Abbasi, Barbara Gay, or Colleen Bloom. Are You Ready for Your Next Fire Marshal Survey? Take the guess work out of survey readiness with the survey checklists used by fire marshal surveyors. Nursing Facility: 1) Emergency Preparedness Survey Document and 2) Life Safety Code 2012 Survey Document. On October 12, 2018, CMS published the Calendar Year 2019 premiums, deductibles and coinsurance amounts for Medicare Part A and Part B services. Welcome Brendan Flinn - LeadingAge National’s New Director of HCBS! Brendan will develop, refine and implement LeadingAge’s national agenda for HCBS and help LeadingAge members plan and implement community service programs. Before coming to LeadingAge, Brendan was the Policy Research Senior Analyst, Long-Term Services and Supports, at AARP Public Policy Institute. He has experience working on home and community-based services and Medicaid, providing policy expertise, research, report writing and fact sheets. He was the in-house expert on millennial family caregivers and wrote a report spotlighting this caregiving generation. He graduated from the George Washington University and University at Albany, NY. Unable to reach a deal on a four-bill appropriations package, Congress has passed a continuing resolution to keep HUD and some other federal programs funded through December 7. While Congress is poised to enact five of the 12 annual appropriations bills before the October 1 start of fiscal year 2019, the HUD bill is not among these. The President signed the continuing resolution on September 28. It’s a well-known phenomenon: emotions are contagious. If you work with people who are happy and optimistic, you’re more likely to feel the same. The flip side is true too: If your colleagues are constantly stressed out, you’re more likely to suffer. How do you avoid secondhand stress? Can you distance yourself from your coworkers’ emotions without ostracizing them? And should you try to improve their well-being? Only 19 percent of nonprofit executive team members strongly agree that their teams focus on the right work. To improve the performance of these vital groups, leaders should ask five critical questions. So, what can you do to keep your star performers motivated? Since engagement is a critical driver of performance, minimizing the gap between what your stars can do and actually do will be vital to achieving the highest level of collective output. Here are a few data-driven suggestions. Week 3 of National Cybersecurity Awareness Month is here, and we will shine a spotlight on helping everyone at work understand the importance of online safety. Tom is adding speaking engagements to his calendar thanks to members who are calling to request him on their meeting agendas. Think about when it would make sense to ask Tom to visit your community. 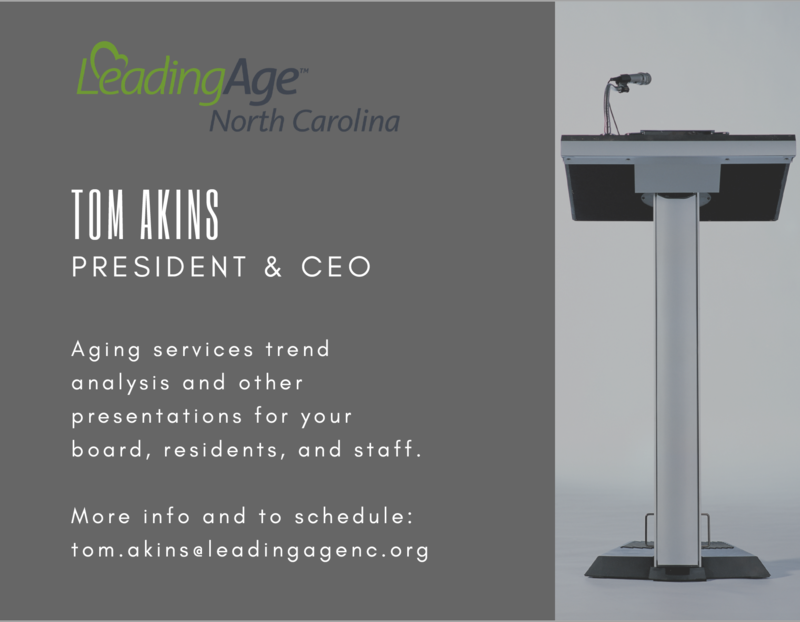 As a free member service, he is available to offer trend analysis presentations and other topics for your constituents. Contact Tom today to discuss your needs or please call Jennifer Gill in our office at 919-571-8333 for more information. 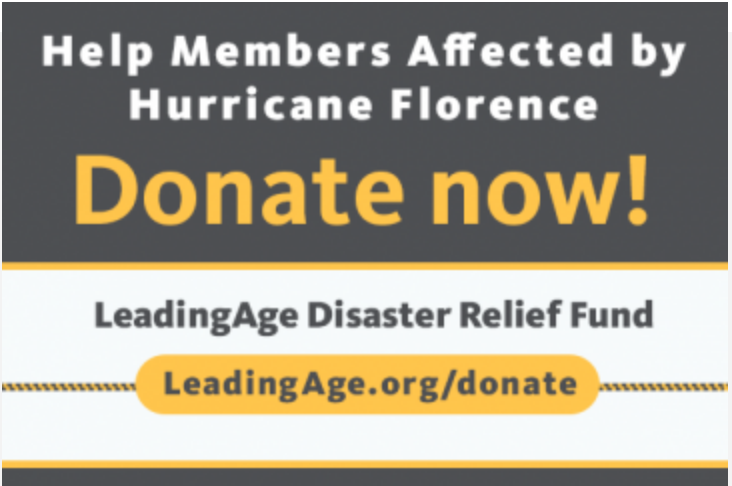 We have received a number of calls and emails from individuals AND businesses asking how they can contribute and we think LeadingAge national’s Disaster Relief Fund is a great answer. 1. LeadingAge national has been through this before, helping members respond to disasters from numerous hurricanes – most recently, Hurricane Harvey in Texas. They have the expertise, integrity, and infrastructure to handle the fund in a trusted way. 2. 100% of all donations will go directly to member organizations and their staff to cover a range of needs including basics supplies such as food and water. All donations are tax-deductible. 3. In talking with LeadingAge Texas about their experience with the fund after Hurricane Harvey, member communities’ staff received the vast majority of disbursements from the fund. We’ll be sharing the process for making requests from the fund with our member community CEOs later today…in the meantime, it might be helpful to know that LeadingAge Texas member communities and their staff received $200,000 from LeadingAge national’s Disaster Relief Fund after Harvey struck in 2016. For a staff member who is facing the unthinkable – a car swept away by flood waters, a home that is underwater, a roof that is missing, children’s clothing destroyed, and more – contributions to the fund will make all the difference. LeadingAge North Carolina has created a page on our website dedicated to disaster resources: preparedness, response and recovery. If you haven't been to the page in the last week, please revisit, as North Carolina-specific resources were recently added. Congratulations to three individuals from North Carolina who have been selected for the upcoming LeadingAge national Larry Minnix Leadership Academy! Veronica Calderon from Aldersgate in Charlotte, Kenneth Jenzen from Givens Estates in Asheville, and Adam Melton from Galloway Ridge in Pittsboro, will begin their year-long program as National Fellows at LeadingAge’s annual meeting in Philadelphia at the end of this month. North Carolina has 29 national Leadership Academy Fellows, the fifth highest total of the 39 states who have had participants in the program since its inception in 2006. The national Leadership Academy now has 471 alumni Fellows. The Caregiver Support Seminar has been rescheduled! We encourage you to register today as space is limited. Every staff person in your community would benefit from the Caregiver Support Seminar we have planned: Nursing, Dining, Administrative Support, Facilities, Therapists, Management, and more. Teams of caregivers (including but not limited to nursing assistants, nurses, dietary aides, support staff, therapists, and administrators) are supporting people living with dementia and their families for a decade or longer. Recognizing changes throughout this long disease can feel like detective work. We will focus on the timeline of this disease and why people do what they do in every stage. Participants will learn: the progression in 5 stages and strategies that work to support people in every stage; ways of adapting help to match a person’s changing needs and foster more positive interactions throughout the progression of dementia. Explore the experiences of those who have had near death experiences, how those experiences have changed their lives and what messages/lessons they would share with others. We will touch on the characteristics of clinical death, the inherent fear of death, and the significance of this topic for professionals who work with the sick and dying. Ethical behavior is based on our value system. Our value system dictates how we will act under varying circumstances. In our society there are two kinds of courage: physical courage and moral courage. Moral courage is a new term in our lexicon and a person with moral courage will make difficult moral decisions without regard to circumstances and consequences. These are real heroes. We will discuss various examples of people who have moral courage and what it takes to make tough moral decisions. Heather McKay is an award-winning occupational therapist and dementia care specialist, consultant, and international trainer/speaker who is passionate about helping healthcare providers and patient families de-mystify dementia care. Through her own diverse experience as a healthcare provider and leader—as well as close family member of a dementia patient—Heather has developed an engaging, measurement-based method for relating to each patient in whatever season. Through her unique and relevant communication tools, and highly-approachable style, Heather transforms the groups she consults—helping front-line staff, leaders, and families to better understand dementia while imparting physical safety and emotional well-being. Heather is also the producer for several widely-distributed dementia care education DVDs—backed by the esteemed Armed Forces Veterans Homes Foundation and the National Association of State Veterans Homes. Dr. Jack Cotter currently resides in Mineral Bluff, Georgia where he works daily to develop and expand his seminars. With a PhD in Educational Leadership, Dr. Cotter motivates and inspires companies and individuals to be the best they can be by offering Customer Service, Ethics and Personality Style workshops. Dr. Cotter's career began as a high school administrator and eventually led to senior positions in both private and public school systems. Make plans now to attend the LeadingAge North Carolina State Night Out, a members-only social event that is held each year in conjunction with LeadingAge national's Annual Meeting & Expo. 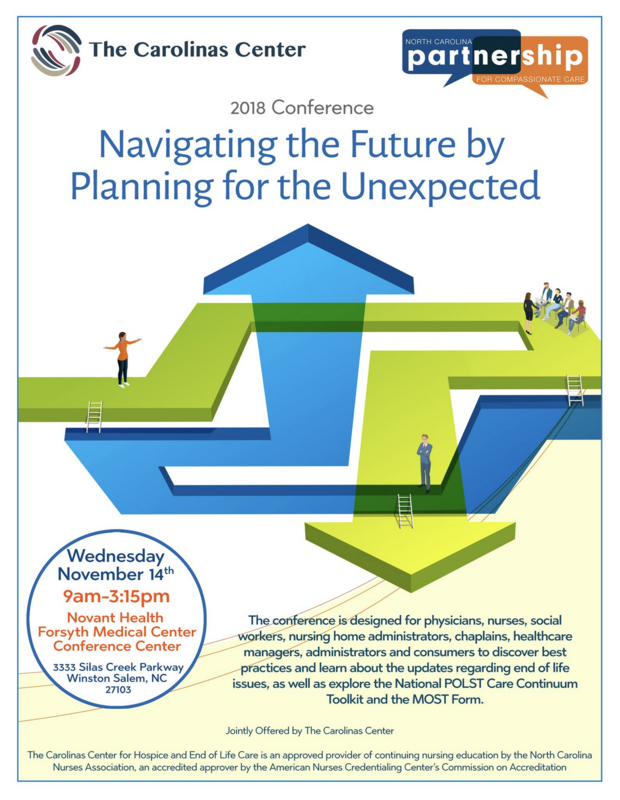 The Carolinas Center has partnered with North Carolina Partnership for Compassionate Care to provide "Navigating the Future by Planning for the Unexpected." This conference is designed for physicians, nurses, social workers, nursing home administrators, chaplains, healthcare managers, administrators and consumers to discover best practices and learn about the updates regarding end of life issues, as well as explore the National POLST Care Continuum Toolkit and the MOST Form. For more information, visit: http://compassionatecarenc.org.